Home / Columnists/ Courting democracy; Housing disaster? A small step was taken by a sovereign court the day before yesterday. It was a giant leap for the supremacy of the Constitution over all three arms of government in a recently benighted Sri Lanka. As well as being the tangible proof of intra-governmental checks and balances being in place. These were signed, sealed and delivered to a closed House by an open-minded Court so that a muddle-headed Executive might be reined in. And the often embattled Fourth Estate or arm of governance can scarce forbear to cheer. That is, the beleaguered free segments of it that haven’t succumbed to the perennial temptation to become a sort of fifth column. In the days and weeks ahead, no doubt many other challenges will be issued in the face of the ostensible independence of the Judiciary. The showing in the House yesterday underscored the desperation of antidemocratic forces feeling the sharp edge of Lady Justice’s sword being probed by a Parliamentary majority against them. If the would-be usurpers were feeling a tad downcast, however, it’s probably more because of the rough and poetic justice meted out to authoritarian aspirants in the floor test. Most MPs present acted as if the hooligans weren’t there. Or if they were that they didn’t count. With that said, it wouldn’t do for democracy’s died-in-the-wool republican regime to rest on its laurels. For winter may have been forestalled. But dark and ice cold forces are gathering on the other side of the wall separating state from anarchy. First, they denied the no-confidence motion on the floor yesterday! Then, showcased House hooliganism as a possible precursor to thuggery on a national scale? And, in a milieu where there are no permanent friends or enemies, a day or a week is a long time if you’re down and desperate. Not to mention the hiatus of a month until the Supreme Court renders its final judgment on the dissolution being caviar to the power-hungry to recoup (pun intended). I dread to think what might have happened since the editors of this paper put the ‘late city’ to bed. One wonders what the respective alliances that litter the political landscape will do now so that they can survive to enlist another day. The SLPP possibly pulled a coup of its own by publicly enrolling a former president – a strong signal that it will go its own way at a future presidential election, despite remaining with its mother ship SLFP in the short term. And the UNP’s canvassing a ‘broad spectrum’ of support simply means it will struggle to retain the status quo, in the face of its oligarchic leadership interpreting the Supreme Court’s impartial view as an endorsement of its lame-duck pseudo-democracy. All of this becomes academic if the ousted de facto premier pulls the plug on any pretence of procedure and unleashes an antidemocratic barrage of preventatives to pre-empt Parliament from sitting today. Such is the timbre of tyranny’s ambitions. This is the time for islanders of all stripes to get savvier about the state of the nation as it is. Not the view sundry propagandists would have us swallow. And make a summer of Yahapalanaya. Or song and dance of its detractors, whether a now ironically named JO or SLFP-SLPP pact. It is an exercise in growing up as a mature polity and responsible electorate that has been long postponed by realpolitik, populism, corruption and the rest of many evils in Pandora’s box of political tricks. There may be hope in the House and metal tempered by fire in the Court. But the people en bloc – the ultimate beneficiary and stakeholder for whom the four estates of government exist – must grow up and debunk the myth of respective political cultures. And so there is now, more than ever, a desperate need for voters of all ilks to recalibrate their expectations of and engagement with their elected representatives. It is no longer sufficient for Colombo’s café society alone to rule the roost of Sri Lanka’s customary cocktail circuit wisdom on social media. While the rest of the country suffers from a deadly mix of chauvinism, ignorance and apathy – relieved now and then by unruly incursions into the capital by purchased ‘people power’. There is a clarion call to critique and counter self-serving short-sighted crown or clown princes making political capital out of coalition politics. Else it would be a crying shame that the courts have given their fellow citizens a chance to redeem our civilisation from an impending dark age at the hands of the barbarian hordes at the gate. It is to be felt by your columnist and likeminded others that our culture and civilisation are at a crossroads. As much as MP and democracy-championing legal eagle M.A. Sumanthiran feels that this is probably the most important judgment rendered by our Supreme Court in its history. But the court of public opinion is nowhere near as individually savvy as those independent savants. The Hun has had his run at Helping Hambantota and Courting China but still enjoys the favour of the choleric hoi polloi. And not for love of buth packets and booze alone. But a faux-Buddhistic Sinhala-ism that beggars belief, reason or logic. The Goth cannot be permitted to ransack the people’s temples or the public treasury again – even though big business among other profit-oriented entities (such as professionals on the take and academics on the mend) have gone round the bend to defend the imperative of a strongman bringing putative stability – at the expense of civic and human rights. And business must see beyond the next five to six years, like big boys; not little kids lapping up profit popsicles like it was still 1977 and open-market principles were the lollies of the long-deprived. The Vandal must be evicted from town hall and marketplace; because despite his seemingly civilised promise of GDP with honour – Growth, Development and Progress with no help from foreign powers (but China’s major role is conveniently forgotten) – he is a savage at heart. And the sooner the better, before that ‘string of pearls’ begins to choke us all from every verdant village by every palmy coast to every spreading plain. Time to unfurl that flag of foolproof patriotism – democratic, socialist-liberal, republican – over every soaring mountain that does not bend the knee to global bullying or local bullheadedness. All this to say that we take our politicos far too seriously for their own good – or not seriously enough for ours and ours. First, they worship us at election time. Then, we fall prey to their disingenuous charades. And finally, we grow disillusioned and vote the other lot in: hoping against hope that they’ll prove different; only to discover that we’ve worshipped a false god to begin with. But simply to say the whole stinking lot belongs in one cauldron is no longer enough. We must empty the whole kit and caboodle without throwing the democratic baby out with the dirty republican bathwater. Bursting the bubble of this blessed sanctity and sanctimoniousness is perhaps best essayed in the form of a laugh. Irony is lost, and satire and parody played straight in readers’ strained brains. So here, for your entertainment and edification, is my own adaptation from BBC’s ‘Yes Minister’ on the state of play in matters political in Sri Lanka today. Hopefully, it will inform and inspire us on the way forward to a better and brighter future for the blessed isle that is still beloved from the brackens of Battaramulla to the backwaters of Bintenne. The Daily News is read by people who think they run the country. These include apparatchiks in a supposedly democratic government who once threatened punitive measures against those who acted contrary to the interests of their beloved prime minister. Shame on you, Sagala! There is such a thing as once favourite ‘nephews’ in the Uncle-Nephew Party – such as Caligula (‘little-boots’) with his Uncle Tiberius – growing too big for their little boots! Pity that the pretty posturing as a pseudo-democrat lasts only as long as the lie of the land is in your favour, isn’t it? The Sunday Observer is read by the people who actually do run the country. Once upon a time – before Sri Lanka was in dire danger of becoming ‘Cloud Coup-Coup Land’ – the country was actually run through the editorial columns of the Observer. Lies, damned lies, and government policy! But that was before the likes of Dharisha Bastians stepped up to the plate to demonstrate that being a State-owned newspaper does not necessarily mean cravenly towing the government line. Well done, you! Hope you get your job back… and keep it under the rule of men entirely great to whom the pen is mightier than both bullet and ballot. The Daily Island is read by people who think they ought to run the country. There was a time, not too long ago, when its columns counted erudite editorialists who could take a nationalist stand without going the whole hog of chauvinism. Pity that so many of its seniors have recently made a pig’s breakfast of thumbing the tub on exceptionalism and particularity. Today, Ada Derana has become its TV counterpart. For these two organs, Ranil might as well not exist. 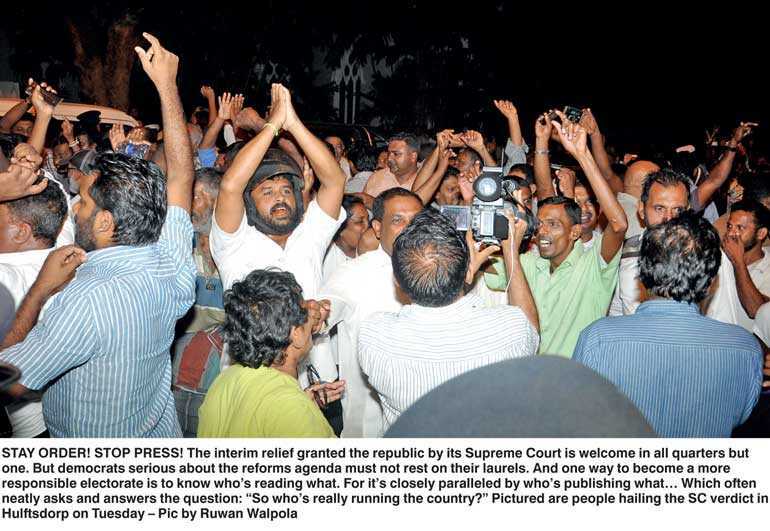 The Colombo Gazette is read by people who think the country is run by another country. Or know it is. Just saying. And they’re just like MTV/MBC/Sirasa, who feel if it is to be another country, it might as well be called the Maharajah Empire, with Chevaan Daniel as premier or Grand Vizier of Gam-Medda, that bid to grasp the village voter by the hand. The Sunday Times is read by people who think they know who runs the country. Or at least they did, until the country bumpkin they linked hands with got fed up of playing second fiddle to a faux-democrat. The Daily Financial Times is read by people who own the country. I might mention my own bias: to cap my pen; and retire somewhere to at least attempt the Great Sri Lankan Novel. But. Not. Yet. ’Nuff said. The rest is silence – until the nation has need of a dose of critical engagement through satire and parody again.